The temple was established at an ancient religious site dating from the fourth millennium BCE that was dedicated to the earth mother, Gaia, and eventually, was the site of a temple to Hera that dated to the Archaic period. 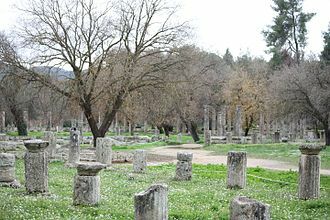 The Altis, the enclosure with its sacred grove, open-air altars and the tumulus of Pelops, was first formed during the tenth and ninth centuries BCE, Greece's "Dark Age", when the followers of Zeus had joined with the followers of Hera. Construction of the temple began around 470 BCE and was estimated to have been completed in 457 BCE. The architect was Libon of Elis, who worked in the Doric style. The temple was of peripteral form, with a frontal pronaos (porch), mirrored by a similar arrangement at the back of the building, the opisthodomos. The building sat on a crepidoma (platform) of three unequal steps, the exterior columns were positioned in a six by thirteen arrangement, two rows of seven columns divided the cella (interior) into three aisles. An echo of the temple's original appearance can be seen in the Second Temple of Hera at Paestum, which closely followed its form, although it is ruined today. From the edge of the roof projected 102 water spouts or gargoyles in the shape of lion heads, of which 39 are extant. Incongruities in the style of the spouts provide evidence that the roof was repaired during the Roman period. The temple featured two pediments: the Eastern pediment depicts the chariot race between Pelops and Oenomaus while the Western pediment features a centauromachy with Theseus and the Lapiths. The god Apollo is featured on the western pediment pointing towards the human side in the centauromachy, indicating his favor, and towards the northern side of the temple. Pausanias reports in his Description of Greece (5.10.8) that the Eastern pedimental sculpture was created by Paeonius and the Western sculpture was carved by Alcamenes. The metopes from the temple depict the twelve labours of Heracles. 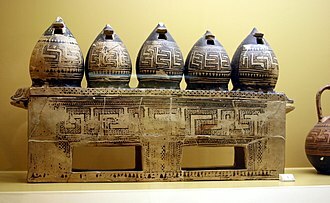 The Roman general Mummius dedicated twenty-one gilded shields after he sacked Corinth in 146 BCE; they were fixed at the metopes of the eastern front side and the eastern half of the south side. In CE 426, Theodosius II ordered the destruction of the sanctuary during the Persecution of pagans in the late Roman Empire. 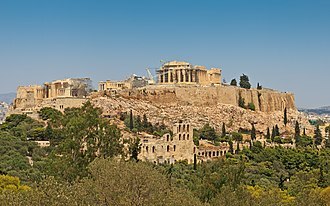 Earthquakes in 522 and 551 devastated the ruins and left the Temple of Zeus partially buried. ^ Hellenic Ministry of Culture. In Greek mythology, the Cretan Bull was the bull Pasiphaë fell in love with, giving birth to the Minotaur. In order to confirm his right to rule, rather than any of his brothers, Poseidon sent Minos the bull, with the understanding that it would be sacrificed to the god. 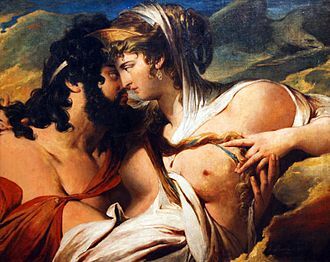 Deciding that Poseidons bull was too fine a specimen to kill, Minos sent it to his herds and substituted another, Poseidon had Aphrodite cause Pasiphaë, wife of Minos, to fall in love with the bull. She subsequently gave birth to the half-man, half-bull, Poseidon passed on his rage to the bull, causing it lay waste the land. After consulting the oracle at Delphi, Minos had Daedalus construct the Labyrinth to hold the Minotaur, Heracles was sent to capture the bull by Eurystheus as his seventh task. 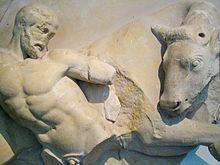 He sailed to Crete, whereupon Minos gave Heracles permission to take the bull away as it had been wreaking havoc on Crete by uprooting crops, Heracles captured the bull, and shipped it to Eurystheus in Tiryns. The bull broke loose and wandered into Marathon, becoming known as the Marathonian Bull, Eurystheus sent Heracles to bring back the man-eating Mares of Diomedes. Androgeus, a son of Minos and Pasiphaë, competed in the held by Aegeus. He won all the games, so angering Aegeus that he had the man killed. Devastated, Minos went to war with Athens and won, as punishment, the Athenians had to send several youths every 9 years to be devoured by the Minotaur. Theseus set to try to capture the bull, on the way to Marathon, Theseus sought shelter from a storm in the shack owned by an old lady named Hecale. She swore to make a sacrifice to Zeus if Theseus was successful in capturing the bull, Theseus did capture the bull, but when he returned to Hecales hut, she was dead. Theseus built a deme in her honor and he dragged the bull to Athens where he sacrificed it to Athena and/or Apollo. 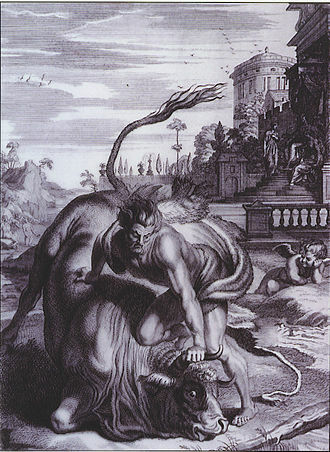 Theseus went to Crete where he killed the Minotaur with the help of Minos daughter Ariadne, according to Jeremy McInerney, the iconography of the bull permeates Minoan culture. The cult of the bull was prominent in southwestern Anatolia, bernard Clive Dietrich notes that the most important animal in the Neolithic shrines at Çatalhöyük was the bull. Ancient Greek architecture is best known from its temples, many of which are found throughout the region, mostly as ruins but many substantially intact. The second important type of building that all over the Hellenic world is the open-air theatre. Ancient Greek architecture is distinguished by its highly formalised characteristics, both of structure and decoration, nikolaus Pevsner refers to the plastic shape of the temple. placed before us with a physical presence more intense, more alive than that of any building. 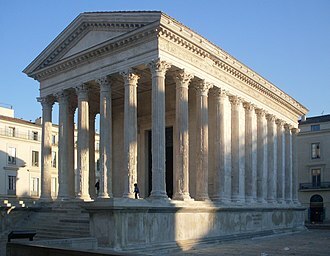 The architecture of ancient Rome grew out of that of Greece, the successive styles of Neoclassical architecture and Greek Revival architecture followed and adapted Ancient Greek styles closely. The mainland and islands of Greece are rocky, with deeply indented coastline, the most freely available building material is stone. Limestone was readily available and easily worked, there is an abundance of high quality white marble both on the mainland and islands, particularly Paros and Naxos. This finely grained material was a contributing factor to precision of detail. 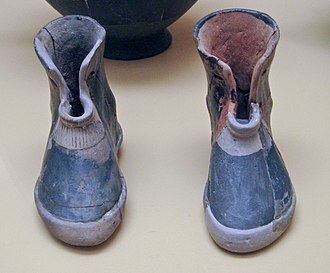 Deposits of high quality potters clay were found throughout Greece and the Islands and it was used not only for pottery vessels, but roof tiles and architectural decoration. The climate of Greece is maritime, with both the coldness of winter and the heat of summer tempered by sea breezes and this led to a lifestyle where many activities took place outdoors. Colonnades encircling buildings, or surrounding courtyards provided shelter from the sun, the light of Greece may be another important factor in the development of the particular character of ancient Greek architecture. The light is extremely bright, with both the sky and the sea vividly blue. The clear light and sharp shadows give a precision to the details of landscape, pale rocky outcrops and this clarity is alternated with periods of haze that varies in colour to the light on it. In this characteristic environment, the ancient Greek architects constructed buildings that were marked by precision of detail, the gleaming marble surfaces were smooth, fluted, or ornately sculpted to reflect the sun, cast graded shadows and change in colour with the ever-changing light of day. Paeonius of Mende, Chalkidiki was a Greek sculptor of the late 5th century BC. In any case, he was “attic-trained. ”Paeonius won the commission to decorate the acroteria of the Temple of Zeus at Olympia, an ancient account references Paeonius work at Olympia. Pausanias attributes the front pedimental sculptures of the Temple of Olympian Zeus to Paeonius, the Nike Temple parapet at Athens is often attributed to Paeonius, on the basis of similarities between the styles of drapery on both monuments. Despite this assertion, scholars continue to debate the reliability of these based upon the various interpretations of the scant additional evidence. The Nike of Paionios featured prominently in the design of medals of the 2004 Summer Olympics in Athens, the statue likely influenced artistic renderings of victory personified. It is on permanent exhibition at the Archaeological Museum of Olympia, the only work that can be positively attributed to him is the statue of Nike discovered at Olympia. 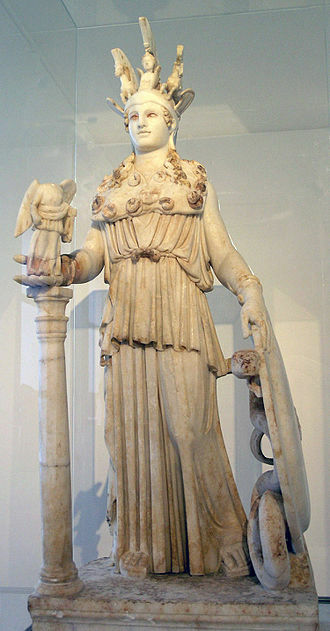 The Nike of Paeonios adorned a three-sided triangular pillar roughly 30 feet tall and she stood in the altis of the sanctuary of Zeus at Olympia. 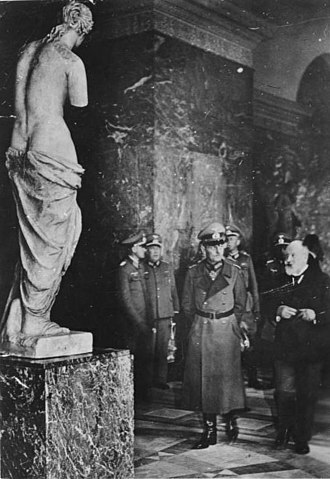 With her wings and head intact, the statue itself was about 3 meters tall and her drapery would have been painted red. The German School began excavations at Olympia in 1875, the French School had done earlier in the nineteenth century. The Nike of Paeonius was erected c.420 BC, a few years after the Athenian allies defeated the Spartans at the Battle of Sphacteria in 425 BC, the inscription reads that it was “dedicated by the Messenians and Naupaktians as a tithe of the spoils of their enemies. The Messenians and Naupaktians, allies of the Athenians, are not to mention “their enemies, ” the Spartans. The placement of this statue at Olympia, considered Spartan ground, is most often interpreted by scholars as a deliberate. This sculpture may be understood as political propaganda within the context of the Messenian Wars, at least a century earlier, the Spartans had erected a statue of Zeus in the sanctuary, commemorating a victory over the Messenians. This dedication is mentioned by Pausanias, the positioning of the Nike may be seen as a visual response, the Nike erected by the Messenians and Naupaktians would appear to the visitor in front of the hand of the Zeus dedication behind it. The Statue of Zeus at Olympia was a giant seated figure, about 13 m tall, made by the Greek sculptor Phidias around 435 BC at the sanctuary of Olympia and erected in the Temple of Zeus there. A sculpture of ivory plates and gold panels over a framework, it represented the god Zeus sitting on an elaborate cedar wood throne ornamented with ebony, gold. The statue of Zeus was commissioned by the Eleans, custodians of the Olympic Games, seeking to outdo their Athenian rivals, the Eleans employed the renowned sculptor Phidias, who had previously made the massive statue of Athena Parthenos in the Parthenon. The great seated statue as fashioned by Phidias occupied half the width of the aisle of the temple built to house it and it seems that if Zeus were to stand up, the geographer Strabo noted early in the 1st century BC, he would unroof the temple. The Zeus was a sculpture, made with ivory and gold panels on a wooden substructure. No copy in marble or bronze has survived, though there are recognizable but only approximate versions on coins of nearby Elis and on Roman coins, in the 2nd century AD, the geographer and traveler Pausanias gave a detailed description. The statue was crowned with a wreath of olive sprays. 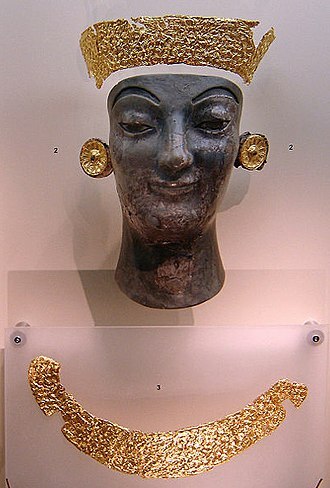 In its right hand was a small statue of crowned Nike. Its left hand held a scepter inlaid with many metals, supporting an eagle, the throne featured painted figures and wrought images and was decorated in gold, precious stones and ivory. 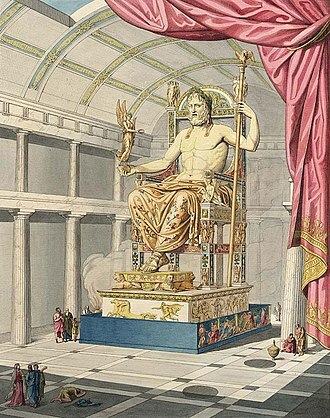 Zeus golden sandals rested upon a footstool decorated with an Amazonomachy in relief, the passage underneath the throne was restricted by painted screens. Pausanias recounts that the statue was kept constantly coated with oil to counter the harmful effect on the ivory caused by the marshiness of the Altis grove. The floor in front of the image was paved with tiles and surrounded by a raised rim of marble. This reservoir acted as a pool which doubled the apparent height of the statue. He spoke, the son of Cronos, and nodded his head with the dark brows, and the immortally anointed hair of the great god swept from his divine head, and all Olympos was shaken. According to Pausanias, when the image was quite finished Pheidias prayed the god to show by a sign whether the work was to his liking. In Greek mythology, was king of Pisa in the Peloponnesus. His father, was the founder of the House of Atreus through Pelopss son of that name. At the sanctuary at Olympia, chthonic night-time libations were offered each time to dark-faced Pelops in his sacrificial pit before they were offered in the daylight to the sky-god Zeus. Pelops was a son of Tantalus and either Dione, Euryanassa or Eurythemista, of Phrygian or Lydian birth, he departed his homeland for Greece, and won the crown of Pisa or Olympia from King Oenomaus in a chariot race married Oenomauss daughter, Hippodameia. Pelops and Hippodameia had at least sixteen children and their sons include Pittheus, Alcathous, Pleisthenes, Thyestes, Hippalcimus, Sciron and Letreus. 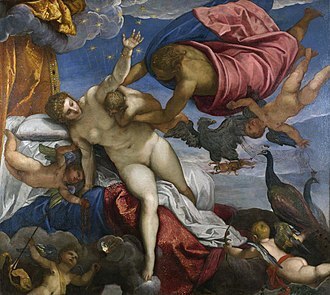 Four of their daughters married into the House of Perseus, Nicippe, by the nymph Axioche or Danais Pelops was father of Chrysippus Pelops is believed to have Anatolian origins. He may have been worshipped in Phrygia or Lydia. 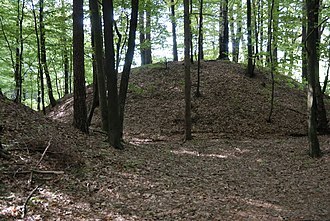 Other ancient mythographers connect him with Paphlagonia and he may have come from the Paphlagonian town of Enete. Others represent him as a native of Greece, who came from Olenos in Achaia, according to Strabo, Pelops cult may have come to the Peloponnese originally from Phthiotis, and was first based in Laconia. 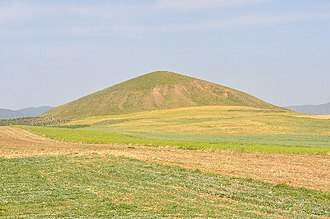 The Achaeans of Phthiotis came down with Pelops into the Peloponnesus, Pelops father was Tantalus, king at Mount Sipylus in Anatolia. 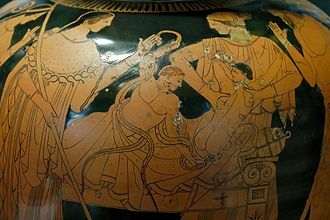 Wanting to make an offering to the Olympians, Tantalus cut Pelops into pieces and made his flesh into a stew, deep in grief after the abduction of her daughter Persephone by Hades, absentmindedly accepted the offering and ate the left shoulder. 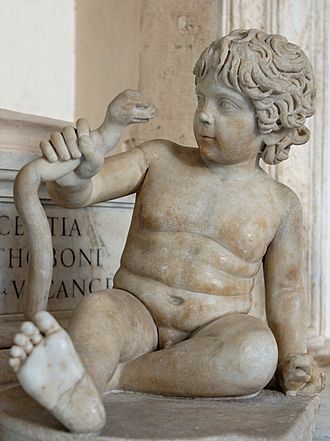 The other gods sensed the plot and held off from eating of the boys body, while Tantalus was banished to Tartarus, Pelops was ritually reassembled and brought back to life, his shoulder replaced with one of ivory made for him by Hephaestus. Pindar mentioned this tradition in his First Olympian Ode, only to reject it as a malicious invention, after Pelops resurrection, Poseidon took him to Olympus, and made him the youth apprentice, teaching him to drive the divine chariot. 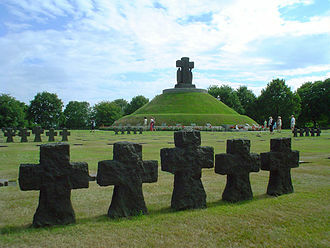 There were a Theodosius II of Abkhazia, a Patriarch Theodosius II of Alexandria and a Theodosius II of Constantinople. Additionally, Pope Theodoros I of Alexandria is known as Theodosius II in Coptic history, Theodosius II, commonly surnamed Theodosius the Younger, or Theodosius the Calligrapher, was Eastern Roman Emperor from 408 to 450. He is mostly known for promulgating the Theodosian law code, and he presided over the outbreak of two great christological controversies and Eutychianism. Theodosius was born in 401 as the son of Emperor Arcadius. Already in January AD402 he was proclaimed co-Augustus by his father, in 408, his father died and the seven-year-old boy became Emperor of the Eastern half of the Roman Empire. Government was at first by the Praetorian Prefect Anthemius, under supervision the Theodosian land walls of Constantinople were constructed. In 414, Theodosius older sister Pulcheria was proclaimed Augusta and assumed the regency, by 416 Theodosius was declared Augustus in his own right and the regency ended, but his sister remained a strong influence on him. In June 421, Theodosius married Aelia Eudocia, a woman of Greek origin, the two had a daughter named Licinia Eudoxia. In 423, the Western Emperor Honorius, Theodosius uncle, Honorius sister Galla Placidia and her young son Valentinian fled to Constantinople to seek Eastern assistance and after some deliberation in 424 Theodosius opened the war against Joannes. On 23 October 425, Valentinian III was installed as Emperor of the West with the assistance of the magister officiorum Helion, to strengthen the ties between the two parts of the Empire, Theodosius daughter Licinia Eudoxia was betrothed to Valentinian. In 425, Theodosius founded the University of Constantinople with 31 chairs, among subjects were law, medicine, geometry, astronomy and rhetoric. In 429, Theodosius appointed a commission to collect all of the laws since the reign of Constantine I, and create a fully formalized system of law. The law code of Theodosius II, summarizing edicts promulgated since Constantine, formed a basis for the law code of Emperor Justinian I, the war with Persia proved indecisive, and a peace was arranged in 422 without changes to the status quo. A 400-year old balete tree with a natural spring between its roots in Lazi, Siquijor, Philippines. It is believed to be home to diwata (anito) spirits. Olympian Zeus in the sculptured antique art of Quatremère de Quincy (1815). 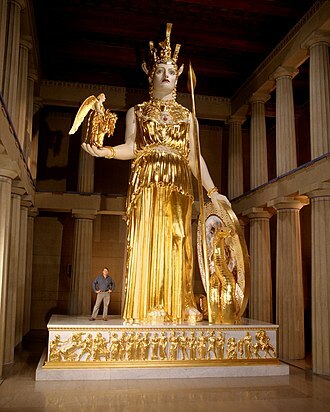 Reproduction of the Athena Parthenos statue in the reproduction Parthenon in Nashville, Tennessee, USA. The Spanish Steps in Rome around 1900. Book illustration from Wilhelm Lübke's Grundriß der Kunstgeschicte (14th edition, with contributions from Max Semrau.) Paul Neff Verlag. Berlin 1908. 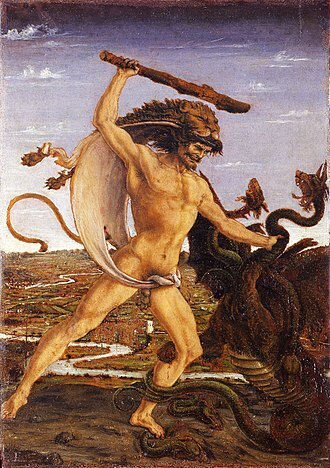 Heracles capturing the Cretan Bull. Detail of a Roman mosaic from Llíria (Spain). 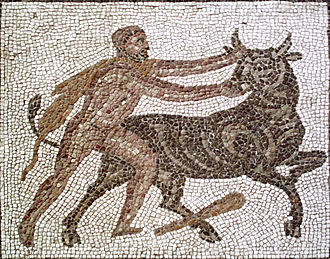 Heracles performing one of his labors as he forces the Cretan Bull to the ground. The engraving was created by B. Picart in 1731.